Brian Shaffer thrived last season after joining the starting rotation late in the year. He went 5-1 as a starter, including a dominant performance against Illinois to capture the Big Ten tournament, and snap the Illini’s 27-game winning streak. In that game Shaffer went seven innings, his longest outing of the season, allowing just one earned run and struck out seven. This season, Brian will slot in nicely as the Sunday starter, as the Terps plan to go with three hard throwing righties (Shawaryn, Bloom, and Shaffer) in their weekend rotation. My favorite baseball memory: Going to the local baseball field to pitch and hit with my dad growing up. Playing here at Maryland makes me appreciate those times even more. Why he chose Maryland: Ever since I was a kid I wanted to play baseball for the University of Maryland and was doubted for thinking I could. When I first stepped on campus I had a satisfactory “I made it” feeling. Favorite Maryland baseball memory: Other than winning the UCLA regional would be when I pitched against the University of Illinois at Target Field and ended their 27-game winning streak. Goals for this season: Stay healthy and do everything I can to help this team win a National Championship. Favorite teammate: I have so many favorites but if I had to choose one teammate, it would have to be Zach Jancarski. He’s one of my best friends and I’ve never met anyone that could make me laugh as much. Walk-out song: Stranglehold by Ted Nugent. Pump up playlist: I don’t really have a pump up playlist but anyone who knows me knows that I love country music. Hobbies: hunt, fish, workout, and hangout by a bonfire with my friends. I also enjoy spending time with my girlfriend. Guilty pleasure TV show: Impractical Jokers and Food Paradise. I love shows that involve food. Dream job besides playing baseball: either a personal trainer or an outdoorsman with my own TV show. After being drafted by the Arizona Diamondbacks in the 35th round in 2014, Justin Morris decided to stay at home and play for the Terps, joining his older brother Zach on the diamond. The younger Morris started 27 games in his freshman campaign, predominately at first base, but also played catcher and DH. He compiled 11 hits last season, including two doubles and a triple. This summer Justin stayed local as well, playing for the Bethesda Big Train. Morris will see a lot more time behind the plate this season, filling the void left by Kevin Martir, who was drafted in the 18th round by the Houston Astros. Favorite baseball memory: Catching my older brother Zach my freshman year in high school while he was a senior. We used to always play catch together in the backyard growing up and it was cool to actually have the opportunity to catch him in a real game. Why he chose Maryland: Being a local kid I always grew up rooting for the Terps. It was important for me to give my family the opportunity to see me play without having to travel so far. I wanted them to be able to come to all my home games. I also really wanted to play a season with my older brother which was also really important to me. I felt comfortable as soon as I got to Maryland. It felt like home. Favorite Maryland baseball memory: Last year winning the UCLA Regional and being part of a special group of guys. Goals for this season: Just to be the best teammate I can be and to do whatever I can to help the team win. Favorite teammate: I love all my teammates. Hobbies: Going to the beach with friends and family. Dream job besides playing baseball: NFL Owner/Coach or a Rapper/Singer or a Pro Surfer. Taylor Bloom is one of a trio of right handers that Maryland will rely on heavily this season. Brian Shaffer and Ryan Selmer are the other two, and they will both be featured on future editions of 25 Days of Baseball. Last season Bloom made 15 appearance for the Terps, 5 of them starts, tossing 33 2/3 innings, and posting a 4.01 ERA. Bloom surged at the end of the season, starting the Big Ten Tournament final against Michigan, and again in the winner-take-all regional final against UCLA. Against the Bruins, Bloom shined, pitching six plus innings, allowing one run, and only two opposing hitter reached base. This season, Bloom is expected to be the Saturday starter for the Terps, and Maryland would greatly benefit from him becoming a fixture in the weekend rotation, as one of the biggest challenges for the team a season ago was finding consistency and stability to follow the Friday night reliability of Mike Shawaryn. Why he chose Maryland: Being close to home really influenced my decision to come to Maryland, as well as just the comfortable atmosphere I got when I first came here. Favorite Maryland baseball memory: Beating UCLA in the regional final in Los Angeles. Goals for this season: To be the Saturday starter throughout the year, and give my team a chance to win every weekend. Hobbies: Hitting the links with some teammates/friends. In his senior year at Shikellamy High School Nick Dunn batted .477, but that wasn’t the average that set the school record. In fact, Dunn batted a whopping .544 in 2013 to claim the Shikellamy batting crown. In addition to hitting .477 his last year, Dunn drove in 32 runs, including seven home runs, while not striking out a single time. This summer, while playing for the Silver Spring-Takoma Thunderbolts, Dunn led the team in hitting with a .321 average, also good for fifth in the entire Cal Ripken League. With Brandon Lowe being drafted by the Tampa Bay Rays, Dunn appears to be the favorite to start at second base for the Terps this season. While he’ll certainly have big shoes to fill, his game also carries many similarities to Lowe’s. Favorite baseball memory: Breaking my high school’s batting average record. Why he chose Maryland: I picked Maryland because of the coaching staff and the team’s recent success. When I first got here I was excited to start getting ready for the season. Goals for this season: I want to contribute as much as possible and do everything I can to help the team make the College World Series. Favorite teammate: I don’t really have a favorite teammate. I enjoy being around the whole team. As a freshman, Zach Jancarski made his biggest impact on the bases. He scored 9 runs in 16 pinch running appearances, including scoring in his first 3 games as a Terp. After being named to the Perfect Game USA All-Atlantic First Team in 2014, Jancarski tallied two hits and two runs in four starts. This summer, he played for the Baltimore Redbirds in the Cal Ripken League, and batted .286, and had 14 stolen bases in 28 games. Favorite baseball memory: playing with my travel ball team through high school and during the recruiting process with some of the best teammates and guys I’ve ever met. I wish all of them success in their future and I look forward to staying in touch with them for many years to come. Why he chose Maryland: I felt that I fit in the best with the way they play and the work ethic that goes into being a successful team on an everyday basis. I also really had a good relationship with the coaches and give them credit for being great recruiters through the whole process. I’m very happy with my decision. Favorite Maryland baseball Memory: Enjoying all of the success we had as a team through my first year in the program. We had a special team last year, and it was fun to be a part of some really big games. Goals for this season: To play as hard as I can every day I step between the lines, and help the team win games at any cost. Walk-up Song: “Minute” by Mike Stud. Hobbies: Playing video games and hanging out with friends and teammates. Favorite place to eat around campus: Chipotle no doubt. Guilty pleasure TV shows: Big fan of the show Friday Night Lights, and I’ll dabble with Keeping Up with the Kardashians on a lazy Sunday or two. In exactly three weeks, the Terps will be a lot warmer, about 30 degrees warmer, as they travel south to Tuscaloosa. 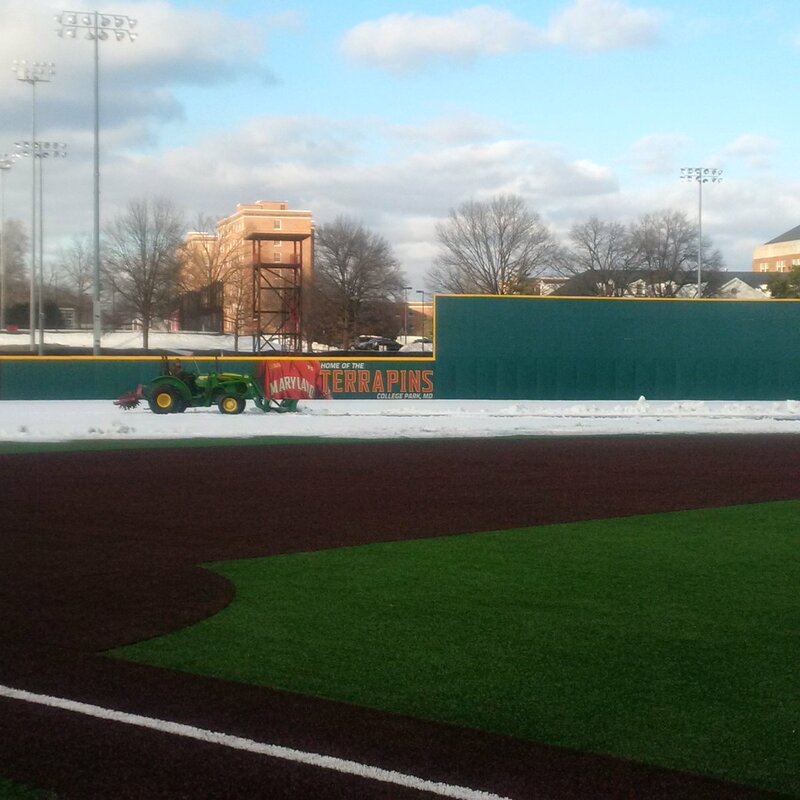 The new all-turf field is already paying dividends, as the team was able to practice on the infield despite last week’s blizzard. John Szefc orchestrated bunting drills outside, while the assistants conducted batting practice in the shell beyond the left field fence. The Terps will go with a four- inning scrimmage tomorrow and work their way up to six-inning scrimmages in the days to follow. The scrimmages will feature live pitching. D1baseball.com and Baseball America have now each released their preseason top 25. Maryland doesn’t appear on either list, in fact, the only Big Ten school ranked on either list is Michigan (15th by Baseball America). But the Terps are using this as motivation, and some within the program have even asserted that this year’s team has more offensive depth than last year’s team. As a freshman, Kevin Biondic worked tirelessly during the regular season to make the transition from third base to first base. But by the time games of the utmost importance were played, Biondic had made his way into the starting lineup. Eight of his 15 hits on the season came in the team’s ten postseason games; he started them all. This season he figures to be the every-day first baseman, and now that his defense is up to the standards of Coach Szefc, his regular at bats should allow his offensive production to really grow. Favorite baseball memory: Hitting the cycle when I was probably 8. My dad was coaching third base and he gave me the stop sign and I ran right through it because I needed the homer. Why he chose Maryland: I choose Maryland becaus I wanted to play at the best level. I was actually on my way to Bowling Green to play hockey until I chose Maryland. Favorite Maryland Baseball Memory: Definitely winning that regional. I thought it was awesome because no one cared about the stats we just wanted to beat the number one team in the country. Goals for this season: I really want this team to go to Omaha. That’s the goal and we all know we can make it. Also everyone wants to have a great year, but I just want to do my job to win ball games. Favorite teammate: A lot of good guys on this team I couldn’t even come close to narrowing it down. But definitely have to give Jancarski a shout out for rooming with on the road and watching Blackhawks playoff hockey with me. Walk-up song: Not sure what my walk up song is yet this year but Many Men by 50 cent last year was a great walk up. Favorite hobby: Playing and watching hockey. Favorite meal around campus: I might have to go with the crunch burger from Bobby’s Burgers. Guilty pleasure TV show & movie: Family Guy and Dazed and Confused. Dream job (besides playing baseball): I really want to become Chicago police officer and work swat. It’s been my dream job since I was a kid.